The season starts early in your home or in your garage or wherever the car is parked and after thinking about it since the end of the previous season you have made a commitment. You have decided to chase the 2016 points tittle for the upcoming season. The past season you received the RMLRA championship trophy. You now hope that you are placed among the top drivers in the local area. Maybe I should go see my shrink after this decision. The race car or cars that I have in the garage are excellent race cars and I have a pit crew that is on top of it to keep the car at the front during a race. Living in Colorado or Wyoming you need the support of enough drivers in your class to receive the maximum points every night in your division that you are racing in. Traveling to Gering, Nebraska to race on a Friday evening you hope that five cars in your class will be there. Legend race car teams have not been real strong fielding race cars to race this far from Denver, Colorado where many teams are located. Breaking this down, you need five cars in your division racing every night to receive one hundred points per night. The thought is to race at least nineteen races and come up with nineteen hundred points to put you in contention for the championship award. Many drivers throughout the country may race up to forty-fifty races or more chasing this championship. Living in the western part of the United States you have to travel many miles to race. Whereas a car racing on the east coast may be able to race several times a week without a lot of travel to and from races. A former RMLRA driver Terry Plummer went traveling during the 2005-2007 season and won the Golden Masters Award. may be days before he finds out what the final outcome will be on his quest for the championship. and later that night you go to bed with all kinds of possibilities that might come your way. The wait for USLCI to make an announcement is going to make for a few sleepless evenings possibly. On Wednesday morning I happened to go to the US Legends web page and read the article on the Legends Asphalt Nationals. 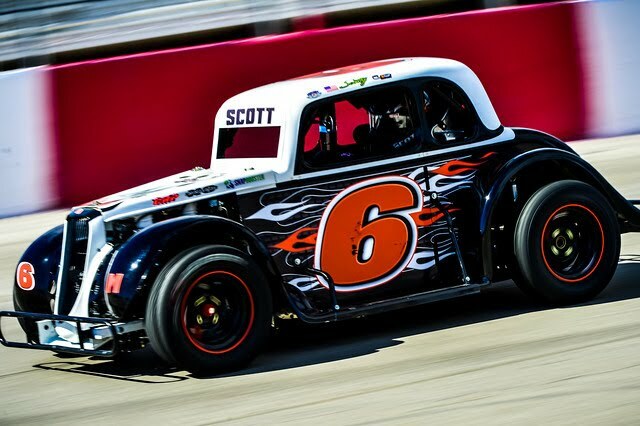 Although Scotty did not race the feature race his qualifying and a heat race victory, plus a second place finish in the second heat race gave him the points for a second place finish at the Nationals. The top two drivers ended up as follows. Do take time to check the final results as several of our drivers did very well this season. L. Scotty Scott did not start racing as a youngster but his family while living in the Cheyenne, Wyoming area was attracted to race cars at an early age. He spent a lot of time at Big Country Speedway watching his Dad and his uncle race modified and late models. We go back many years, when the modified's traveled to race on many area tracks in the states of Wyoming, Nebraska and Colorado and possibly a few more states not mentioned. Scotty has said many times that he thanks his family for the opportunity to race his Legend car.